Move to Windows 10 Pro devices today. After January 14, 2020, Windows 7 will continue to work, but you will no longer receive updates or support from Microsoft. This includes non-security related hotfixes, new security updates, paid or free Microsoft support options, and online technical content updates from Microsoft. In other words, PCs running Windows 7 after January 14, 2020, are unprotected. That’s why it’s essential for businesses to migrate to devices that run a more current operating system like Windows 10 Pro. Windows 7 end-of-life is only one reason to replace older computers. They also cost you time, money, and frustration. 1. Outdated—Every PC older than four years old could potentially cost you more money in maintenance, repairs, and lost productivity1 than the cost of a new computer. 2. Lagging—New Windows 10 Pro devices startup on average up to 28% faster2 and have batteries that last up to 3x longer3 than older Windows devices. 3. Vulnerable—Cyberattacks and data breaches cost over $84,0004 and affect more than 50% of small businesses5. New Windows 10 Pro devices have built-in and continuously updated security^ to help keep you protected. 4. 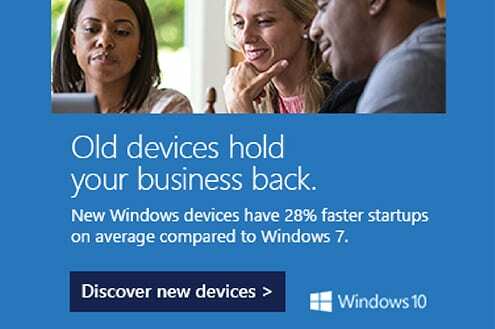 Hard to Manage—IT admins send up to 20% less time managing Windows 10 Pro Devices6. Plus, your team can sign in once for Microsoft services and many apps. And, many of your current apps and peripherals work with Windows 10 Pro. Even though, January 2020 may seem like a long time from now, when you’re updating and replacing multiple computers for your business, the switch to Windows 10 takes time and planning. There are a variety of productive and secure PCs across a wide price range—one of them is right for your business needs. QualityIP can help you map out a strategy for upgrading and choosing the best fit for your environment. 1Small Business PC Study, TechAisle, 2016. 2Testing conducted by Principled Technologies in July 2015 in a closed lab environment using OEM factory default images on a representative sample of Windows 7 devices. Each boot test was run 10 times and the averages compared. Average improvement in startup was 28%. 3Performance of 6th Gen Intel® Core™ processors in Windows 10 devices, estimated based on Windows 8.1 Local HD Video Playback Power, Comparisons based on Intel® Core™ i5-6200U vs. Intel® Core™ i5-520UM. 4Small Biz Daily: 10 Small Business Trends 2018. 5Ponemon; 2016 State of Cybersecurity in SMB (USA); Canadian Chamber of Commerce, An Analysis of the Adoption of Internet-based Technology, February 2017. 6As compared to prior version of Windows. Forrester, Total Economic Impact of Windows 10. ^For the supported lifetime of the device.